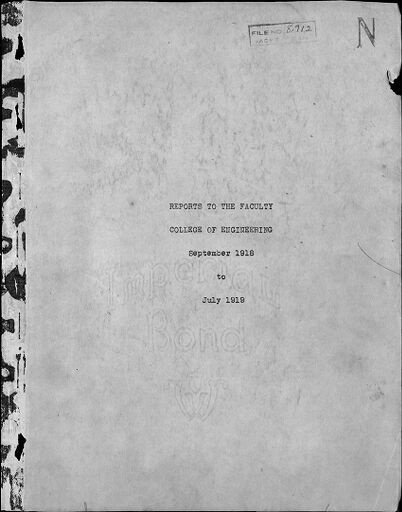 Digital Surrogates from Faculty Reports of the College of Engineering (1918-1927), include copies of correspondence, course schedules, and minutes concerning proposed revisions to the curriculum, such as the addition of courses pertaining to war issues during World War I; faculty committees; student enrollment statistics; special events and lectures, including efforts to invite the Society for the Promotion of Engineering Education to the University of Illinois (1919-1920); the implementation of an engineering aptitude test for college freshman in order to better shape students' course selections (1919); and new faculty at the college. The Faculty Reports (Digital Surrogates), 1918-1927 are managed by the University of Illinois Archives and do not feature precise descriptive information for each item. Discover their contents by browsing the folders and files. For more information, contact an archivist at illiarch@illinois.edu.